... and some of the things of which we're proud. Robin's Book Store is the oldest Independent Book Store in Philadelphia, opened by my grandfather in 1936. 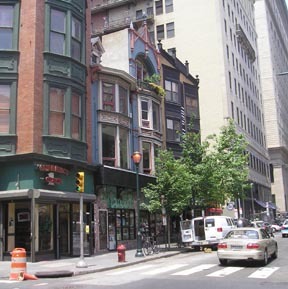 I have lived in Center City for over 60 years and have worked in the book business for over 40 of them. The joy of the book business is that you are working with language, ideas, and people. Have you read this author? Here is so & so's new book. Let me show you this poet I just "discovered." Precious commodities to be shared. And then there is politics! I believe in Democracy, I believe that people must have total access to all information. We are always fighting the Freedom To Read battle, from Tropic of Cancer in the 60's to Child Access laws in the 70's, to Salmon Rushdi in the 80's, to Jock Sturges in the 90's, to the Patriot Act today. We carry The Communist Manifesto and Mein Kampf. As Ralph Wiley said at an autographing here, "Nobody ever learned anything by not reading something." We do individual author and group events, we do poetry and politics, we have a great African American section, and really good poetry, literature and children's sections, lots of psych and new age, and some of everything else. We have a second floor full of bargain books and magazines. We play jazz and classical music depending on my mood. We have an annex at 1837 Chestnut Street that is exclusively bargain books and magazines. Moment 3: Date, DEF Robin's adds all books from the banned book list and makes them easy to buy in Philadelphia. Moment 5: Robin's stops selling overpriced coffee deciding we're in the business of selling books and providing a space of peace for the curious. Robin's resolves the issue by recommending that people buy lower priced coffee from the street vendors and bring them into the stores. Thus, saving everyone headache, money and supporting 2 independent business with one experience.